Researchers at the Department of Energy's Lawrence Berkeley National Laboratory (Berkeley Lab) have identified 14 genes that regulate genomic integrity, which were consistently overexpressed in a wide variety of cancers. In the new study—“Centromere and kinetochore gene misexpression predicts cancer patient survival and response to radiotherapy and chemotherapy”—which was published recently in Nature Communications, the investigators created a scoring system based upon the degree of gene overexpression: the higher the score, the worse the prognosis. Moreover, the scores could accurately predict patient response to specific cancer treatments for several different cancer types. The Berkeley Lab team is hopeful that these findings will help doctors and their cancer patients decide if a particular therapy would be worth pursuing. One of the challenges is that there has been no reliable way to determine at an early stage if patients will respond to chemotherapy and radiation therapy. The authors believe their research could lead to a new biomarker for the initial stages of tumor development. The information obtained could help reduce the use of cancer treatments that have a low probability of being effective. The researchers noted there are many factors a doctor and patient must consider in treatment decisions, but their biomarker results could become a valuable tool when deciding whether to use a particular therapy or not. The new study focuses on genes that regulate the function of centromeres and kinetochores—the essential sites on chromosomes that spindle fibers attach to during cell division. The new findings build upon earlier research by Dr. Karpen’s group and other labs in the field. In normal cell division, microtubule spindles latch on to the kinetochores, pulling the chromosome's two chromatids apart. Dr. Karpen’s previous work found that fruit flies overexpress a specific centromere protein resulting in extra spindle attachment sites on the chromosomes. While chromosomal instability has long been recognized as a characteristic of cancer, its cause has remained unclear. To determine if centromeres play a role in chromosome instability for cancer, the researchers analyzed many public datasets that together contained thousands of human clinical tumor samples from at least a dozen types of cancers. The researchers screened 31 genes involved in regulating centromere and kinetochore function to find the 14 that were consistently overexpressed in cancer tissue. The extensive records allowed the researchers to correlate the centromere and kinetochore gene expression score (CES) with patient outcomes either with or without treatments. 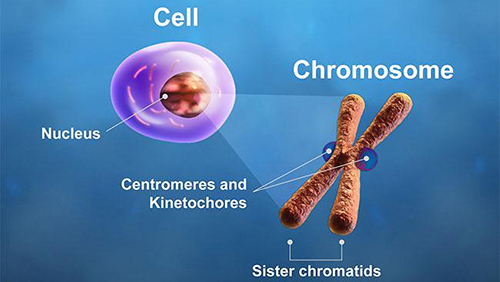 The Berkeley Lab group hypothesized that the degree of chromosomal instability might also make cancer cells more vulnerable to the effects of chemotherapy or radiation therapy. Although their findings were exciting, the study authors caution that translating these findings into clinical advice and practice will take more research. The team is currently working to find that threshold of genome instability so that in the future, doctors and patients can make informed decisions about how to move forward.